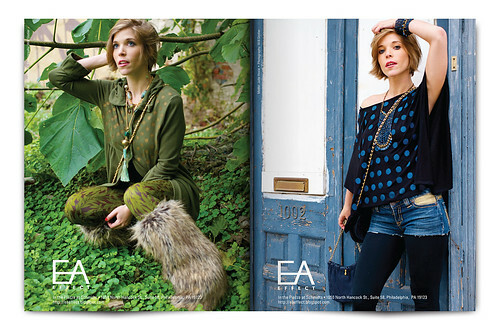 I recently finished a Look Book graphic design project for EA Effect Boutique‘s Fall/Winter 2011 line. 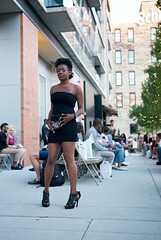 Looks and makeup are by designers Ella Kolanowska (Pearl in Crown) and Anya Payne (Independent Flavor). The model is Julie Hoxie. Photography and graphic design by me. The project’s first goal was to shoot Julie in looks from Ella and Anya in a single afternoon, working shot-by-shot to match varied Philadelphia environments with the feel of each look. 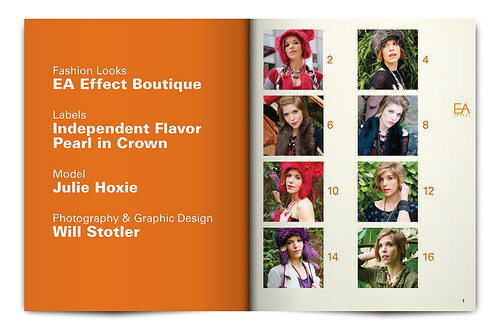 The project’s second goal was to create a convincing, press-ready Look Book, based on the client’s selections of shoot photos. The project’s third goal was to experiment with brand development: developing and packaging a concept that credibly defines the look of the EA Effect brand. 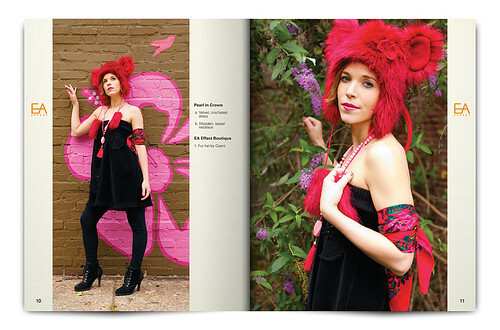 This look book’s concept and design is likely overkill for a boutique in the Philadelphia marketspace, but appropriate for a boutique in London, New York, or Los Angeles. Well, why not think big? The project started in conversations with fashion designers Ella Kolanowska and Anya Payne. 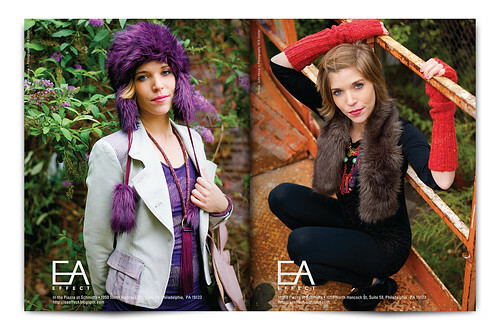 Ella and Anya own and operate the EA Effect Boutique (they are the “E” and “A” in the boutique’s name). Each designer has her own clothing and jewelry lines under the EA Effect umbrella: Ella has Pearl in Crown and Anya has Independent Flavor. After a June meeting, Ella and Anya agreed to a city-look shoot for the EA Effect brand, provided the urban look wasn’t sleek with glass and steel and concrete. They wanted their brand to be surrounded by earthy textures, a bit of nature, and “colors.” I agreed to pull that look out of the city, which is a challenge. Ella and Anya selected the model to represent their brands’ looks: Julie Hoxie. Julie is a new model–professionally, she’s a pattern designer for the fashion industry–and a natural. Time was very tight during the shoot in October. The original plan called for shooting eight looks from each designer–I was able to pull eight looks, total. Ella and Anya are “we know what we want when we see it” clients. This means that a range of photographic concepts had to be shot so Ella and Anya could decide on just the “right” look to represent their brands. This meant I needed to shoot between 7 to 9 “mini-sessions” per ensemble. All told, this added up to over sixty “mini-shoots” in a single afternoon. Each of the “mini-shoots” was in a different location I selected on-the-fly for color, texture, and feel to compliment the look Ella and Anya had selected for Julie. I worked with Julie in each location to get performances that could compliment both the environment and the fashion. In the end, Ella and Anya were able to pull together what they wanted based on the wide range of options they received. So, I consider this approach very successful. 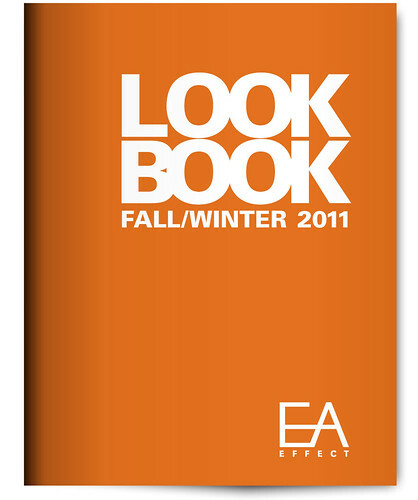 Structurally, the look book uses a modified grid structure, with a vibrant tangerine color to compliment the EA Effect logotype. The mood of the book is design-forward, with a simplicity and order that compliments the organic and earthy tones/settings found in the photography. 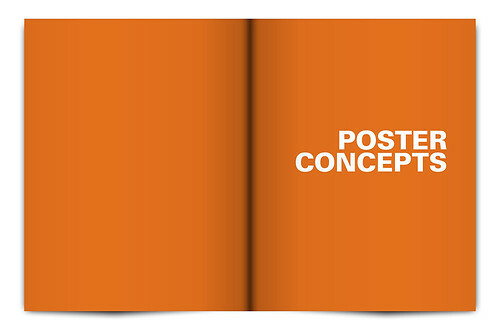 Each piece in the look book is handled as a unique item deserving of indexing and explanation–from the photography through to the design. As an aggregate, it’s clear there’s a collection here with a unified driving concept–from the ensembles through to the environment, to include Julie’s modeling performances. Eight final looks and also six EA Effect poster concepts are included, as I was thinking about this project from a fashion marketing campaign perspective. I’d like to again thank Ella, Anya, and Julie for their work on this project. Well done–good learning experience. 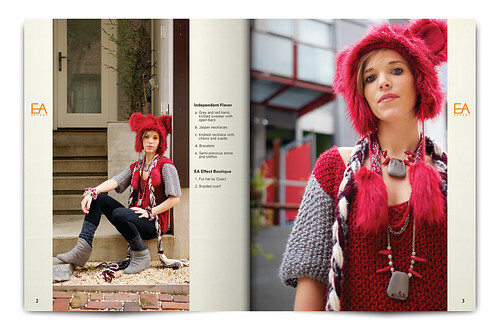 See this Look Book in a slideshow. See more in the EA Effect Fashion Shoot set. Good modeling happens between your ears. Who you know is significantly less important than what you do. Modeling leads to more modeling. Very much can be made from very little and very little can be made from very much. The perceived importance of hair, makeup, clothes, and shoes is overrated. Your feelings about a shoot shouldn’t color your evaluation of a shoot’s photographs. A photographer’s work is more important than a photographer’s name. You must work to get the best performance from the photographer. To determine the metrics, I created a set of the 100 “most interesting” images (according to Flickr, not me) that (a) contain models and (b) were shot in 2011. “Most interesting” is what Flickr determines to be “interesting”—it has nothing to do with personal opinion—based on data Flickr has related to the how and when the photo is viewed. Here’s some information about 2011’s Most Interesting 100. 69% of the Most Interesting 100 are from 6 sets. This is the “short tail.” There is a clear preference to these sets over all others shot in 2011. 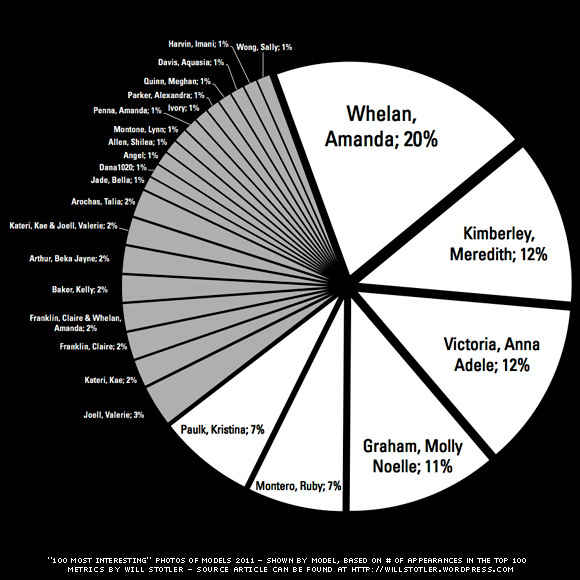 31% of 2011’s Most Interesting 100 are from 7 sets. This is the “long tail.” Items in parenthesis “()” show the name of an “event set,” which is named after the event where the model appeared with other models. Shots containing two models were counted as unique objects. I’ve been thinking about this all year as I’ve been shooting. For 2011, a little over half (53%) of the photos identified by Flickr as “interesting” are interesting as photographs. These photographs have a special handling of moment, subject, environment, light, texture, depth, and color. I classify the other half (47%) as pictures–they’re missing something and I consider them to be credible “outtakes.” Meh. So it goes. The following characteristics from 2010 have been retired—I’m not posting black and white shots with any frequency, cluttered/uncluttered backgrounds supercede the idea of outdoor/indoor location, and I’m not shooting in “available darkness” very much. As always, I’d like to thank every model I shot with during 2011—without your participation, work like this wouldn’t be possible. See 2011’s Most Interesting 100 at Flickr. 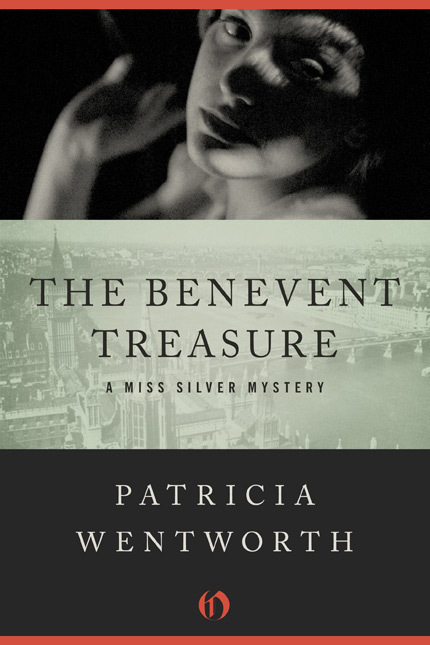 One of the noir photos I took of Erin Peterson at the Shooting Noir event was selected by UK designer Jason Gabbert for use in his cover treatment of the novel The Benevent Treasure. See more about the novel on iTunes, Amazon, Sony Reader Store, or at Barnes & Noble. Jason then contacted me on behalf of his employer and offered a small fee for use of the image as he felt it would serve his cover design needs. I reviewed his portfolio of work. 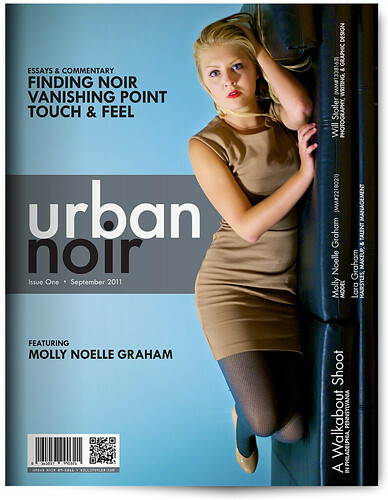 Based on its quality, I coordinated with model Erin Peterson and then provided Jason with the needed paperwork/agreement to use the cover for the novel. The result of his work is below, reproduced with permission by Jason Gabbert (book cover designer) / Open Road Media (publisher). A little backstory: This photo was always one of my favorite lighting shots from the Noir shoot, even if it wasn’t popular. . . . 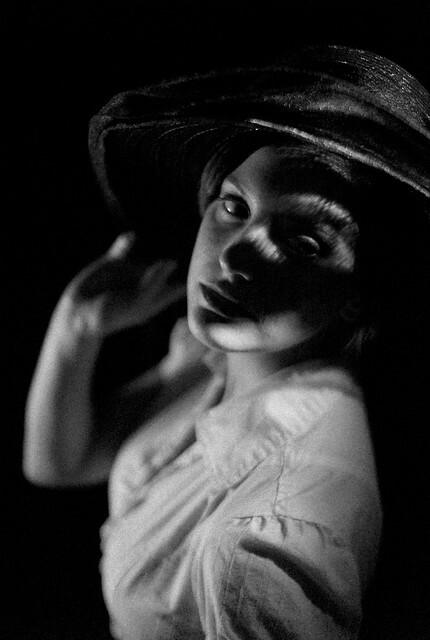 I had been experimenting with how to properly light Erin to get a good noir look and noticed her hat. Normally, hats are problematic because they block light. However, the hat she was wearing was large and semi-translucent, with a mesh gauze. I asked to examine the hat. Erin was slightly perplexed when I took it, turned it over in my hands, and held it up to the light, eyeballing it carefully. After I inspected it, I decided to light her face primarily through the hat, with a bit of fill light added from the side. This effect produced the extraordinary shadows on her face, especially the biting look/texture that consumed her left eye (and that I love). Thanks are due to Erin Peterson (MM#1458115) for modeling, Heather H (MM#1281783) for the makeup, Albert Heefner and Joe Burke for hosting the Noir meetup event, and to Jason Gabbert, for selecting the photo for use. 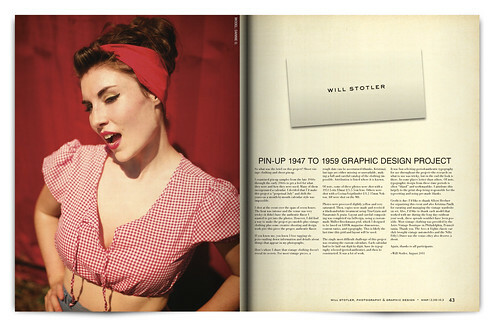 The goal was to get a convincing pin-up look so that photos could be used in a vintage graphic design project. I examined pin-up samples from the late 1940s through the early 1960s to get a feel for what they were and how they were used. Many of them incorporated a calendar. I decided that I’d make this project a “perpetual July” and shift the years–as a month-by-month calendar style was impossible. Vintage sailor top and Navy skirt provided courtesy of Astro Vintage, Philadelphia. Photo above shot with a 1953 Leitz 5cm f/3.5 lens. Photo left and next page shot with a Cosina-Voigtländer Nokton 35mm lens at f/1.2 with a 6-stop ND filter. Both lenses were mounted on a Leica M8. 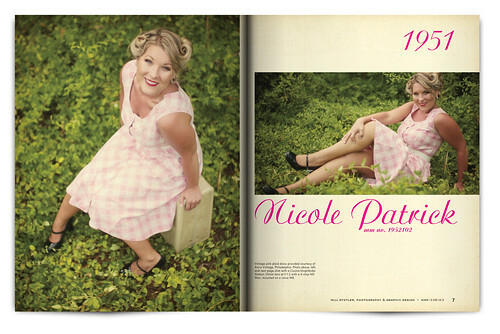 Vintage pink plaid dress provided courtesy of Astro Vintage, Philadelphia. Photo above, left, and next page shot with a Cosina-Voigtländer Nokton 35mm lens at f/1.2 with a 6-stop ND filter, mounted on a Leica M8. Vintage front-pleat Capris with red trim provided courtesy of Astro Vintage, Philadelphia. Red top from collection of the model. Photo above and next page shot with a 1953 Leitz 5cm f/3.5 lens. Photo left shot with a Cosina-Voigtländer Nokton 35mm lens at f/1.2 with a 6-stop ND filter. Both lenses were mounted on a Leica M8. Photo left, above, and next page shot with a Cosina-Voigtländer Nokton 35mm lens at f/1.2 with a 6-stop ND filter on a Leica M8. Reproduction Rockabilly dress courtesy of Vintage Beauty Clothing. Photo left and next page shot with a Leica Super-Elmar-M 18mm f/3.8 lens. Photo above shot with a Cosina-Voigtländer Nokton 35mm lens at f/1.2 with a 6-stop ND filter. Both lenses were mounted on a Leica M8. Vintage mint green ruffle dress provided courtesy of Astro Vintage, Philadelphia. Photo above and left shot with a 1953 Leitz 5cm f/3.5 lens. Photo next page shot with a Cosina-Voigtländer Nokton 35mm lens at f/1.2 with a 6-stop ND filter. Both lenses were mounted on a Leica M8. Vintage two-piece pink playsuit appears courtesy of Lauren Homer. Photo above shot with a 1953 Leitz 5cm f/3.5 lens. Photo left and next page shot with a Cosina-Voigtländer Nokton 35mm lens at f/1.2 with a 6-stop ND filter. Both lenses were mounted on a Leica M8. Reproduction Monique Dress in Carnival Print from Heartbreaker Fashion. Photo left and above shot with a Cosina-Voigtländer Nokton 35mm lens at f/1.2 with a 6-stop ND filter. Photo next page shot with a 1953 Leitz 5cm f/3.5 lens. Lenses were mounted on a Leica M8. Vintage Kamehameha bathing suit appears courtesy of Astro Vintage, Philadelphia. Photo above shot with a 1953 Leitz 5cm f/3.5 lens. Photo left and next page shot with a Cosina-Voigtländer Nokton 35mm lens at f/1.2 with a 6-stop ND filter. Both lenses were mounted on a Leica M8. Two-piece bikini supplied by the model. Harley Davidson motorcycle and shirt provided courtesy of the Aces & Eights Car Club. Photos shot with a Cosina-Voigtländer Nokton 35mm lens at f/1.2 with a 6-stop ND filter on a Leica M8. So what was the brief on this project? 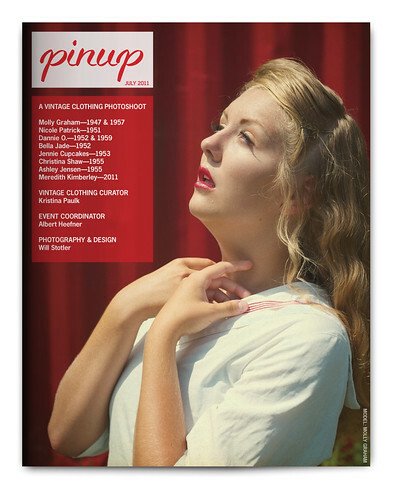 Shoot vintage clothing and shoot pin-up. I shot at the event over the span of seven hours. The heat was intense and the venue was very tricky–it didn’t have the authentic flavor I wanted to get into the photos. However, I did find a way to make the project go–models plus vintage clothing plus some creative shooting and design work give this piece the proper, authentic flavor. If you know me, you know I love tagging objects–nailing down information and details about things that appear in my photographs. Here’s where I share that vintage clothing doesn’t reveal its secrets. For most vintage pieces, a rough date can be ascertained (thanks, Kristina), but tags are either missing or unreadable, making a full and careful catalog of the clothing impossible. Attribution is listed where it is known. Of note, some of these photos were shot with a 1953 Leitz Elmar f/3.5 5cm lens. Others were shot with a Cosina-Voigtländer f/1.2 35mm Nokton. All were shot on the M8. Photos were processed slightly yellow and very saturated. Then, copies were made and received a black-and-white treatment using TrueGrain and Panatomic-X grain. 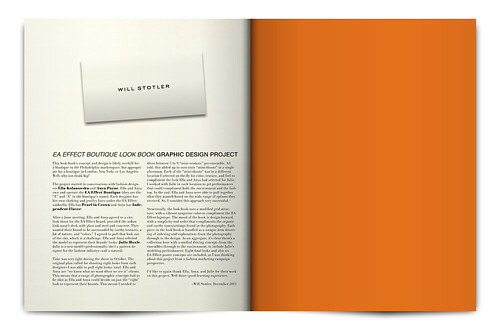 Layout and careful compositing was completed via InDesign, using a custom-made Müller-Brockmann grid, which I designed to be based on LOOK magazine dimensions, content ratios, and typography. This is likely the last time this grid and layout will be used. 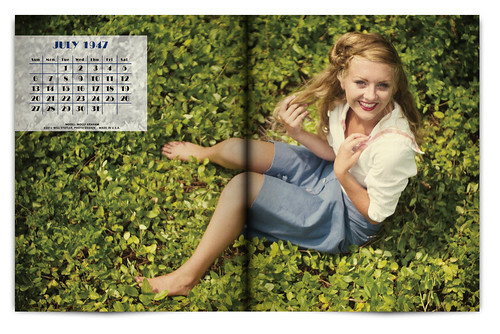 The single most difficult challenge of this project was creating the custom calendars. Each calendar had to be laid out digit-by-digit, have its typography selected (period-authentic), and then be constructed. It was a lot of work. It was fun selecting period-authentic typography for use throughout the project–the research on what to use was tricky, but in the end the look is there. In some places better than others. Of note, typographic design from these time periods is often “bland” and workmanlike. I attribute this largely to the print shop being responsible for the typesetting and using pre-made blanks. Credit is due: I’d like to thank Albert Heefner for organizing this event and also Kristina Paulk for curating and managing the vintage wardrobe on set. Also, I’d like to thank each model that worked with me during the long day–without your work, these spreads wouldn’t have been possible. 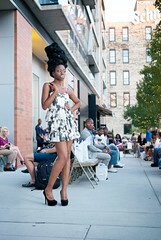 Most vintage clothing was provided by the Astro Vintage Boutique in Philadelphia, Pennsylvania. Thank you. The Aces & Eights classic car club brought vintage automobiles and the Nifty Fifty’s Diner was the venue–they also deserve a shout. Again, thanks to all participants. See the full set of photos. 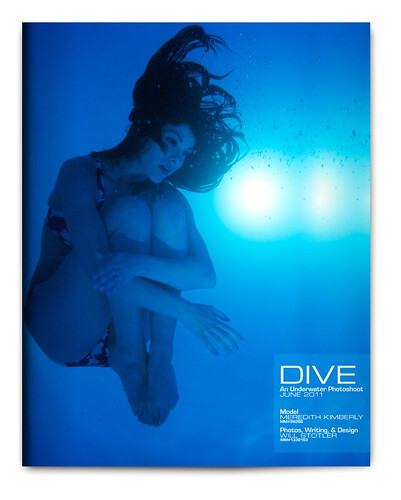 My design goal was to contextualize the underwater shoot and bring some meaning to the images via brief text and captioning. 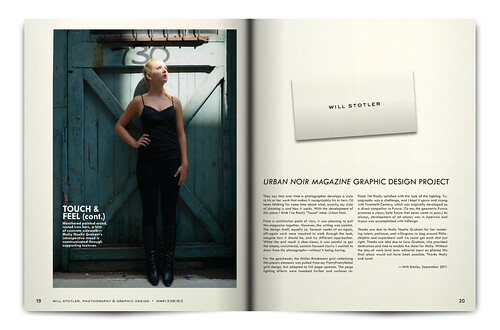 It was another opportunity to use the Müller-Brockman grid, while seeking a clean, modern look. The weightlessness of the underwater environment encourages photographs like this–free floating, as if in deepest space. Surrounded, for a moment, by blue void and tranquility. Unbroken silence. For a moment. A push through the water–leaving a trail of bubbles and churn, captured as glistening spheres, a cloud of motion-that-was. Up is down and down is up, the light playing on every trail left behind. The water’s surface, seen from beneath, is a mirror, trapping and reflecting light. Tilted, and working the angles, the surface becomes a wall of liquid, suspended in space before a traveler: a gateway to another world. Captured breath, rising, and otherworldly hair playing in the void are the only hints of which way is up. Slow motion, frozen in time. My interest in underwater shooting began near the end of the Summer of 2010: It started with a thread I wrote on the Leica User Forum asking if there were any way to shoot the M8 underwater–apart from spending eight thousand dollars on a custom-made housing, of which (I learned later) only 12 were made. Comments ranged from “why would you want to use an M8 for that?” through to a few snide drive-bys. Apparently, it hadn’t been done. Within a week or two, I acquired an EWA Marine U-F housing, which includes a built-in glove for focusing and adjusting camera settings. The housing is an industrial-grade plastic bag with a glass porthole in the front, rated to a depth of 33 feet. The M8 drops into the housing. While running a few underwater tests, I discovered that the rangefinder (used to focus the camera) didn’t work in the bag. Framing was troublesome: The glass porthole and lens adaptor blocked about 60% of the viewfinder, which was troublesome to use underwater anyway because of distortion. But, I got some interesting shots over a few days, the possibilities seemed bright, and we closed the pool for the season. The work itself was very tricky. Light: Light was at a premium (we were shooting at night). 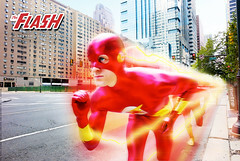 I encountered the troublesome tradeoff of speed (usually 1/180th of a second) versus depth of field. Depth of Field: These photos were all shot at f/2, which at a medium distance provides a foot-or-so of perceived “sharp enough.” But it’s not a lot to work with when you and the model are both drifting. Focusing was accomplished by measuring distance from camera to subject, prior to submerging, by 3.5 foot, 7 foot, and 15 foot pieces of string. 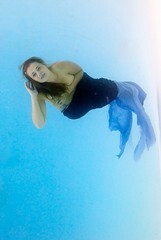 Like this: Submerge and don’t shift distance forward or back. Additional light was added in some of the shots by free-handing a very strong diver’s light. This had mixed results. But I haven’t played with it enough yet. I have ideas. I can’t stress enough that Meredith was an excellent sport and very collaborative when working to get a good performance. Repeated submerging. Treading water. (And not very warm water, at that.) Me: “I didn’t get it. Let’s do it again.” Meredith: “OK!” Thanks much! Yes. I am doing this the hard way. Because doing things “the hard way” builds skills while leading to new ways of working and, often, new and interesting results.